Yay for birthdays! A proper excuse to make cakes and special desserts! I came up with this strawberry-lemon thingy for my mum's birthday last month, making use of the last of the British strawberries that I got from the local farmers' market. There's not really a recipe, as amounts will vary depending upon the size of your strawberries and dessert rings, but it is easy to make and can be put together a few hours ahead, or the night before. Place some dessert rings onto a small lined baking sheet. Finely crush some shortbread biscuits and mix with a little unsalted melted butter to line the rings. In a large bowl, using an electric whisk, beat 250g mascarpone cheese with a couple of tablespoons of caster sugar to taste. With the whisk running, slowly pour in about 150ml double cream. Whisk until the mixture starts to thicken and becomes firm, but don't over whip. Fold in the grated rind of a lemon and some lemon juice to taste. Wash and slice the strawberries in half, you may need to slice the bottoms to make them fit the rings. Place into the rings with the cut sides against the rings. Spoon in the mascarpone filling and smooth the tops with a knife. Place in the fridge to set for 3-4 hours or overnight. To serve, lift the rings carefully using a fish slice or spatula and place onto serving dishes. Warm the rings with your hands or very lightly waft a cook's blowtorch on the edges for a couple of seconds. Remove the rings, top with blueberries and dust with icing sugar. Yay for lists! I made it onto one! I'm no. 72 of '78 Mouth-Watering Baking Blogs You Need to Bookmark'. Pop over to the Culinary Arts College website and have a look at some of the other blogs - you might be there for a while as there are some really good bread, baking, cake and dessert sites on that list! This content belongs to Nicisme at Cherrapeno. All writing and photography copyright N Fowers © 2007-2010 unless otherwise indicated. All rights reserved. Oh, and Happy Birthday to your Mum! Delicious and so elegant ! A colourful birthday cake ! Happy birthday to your Mum Nic. These are gorgeous. Love the fact that they are so simple, yet so effective! WOW!! oh what a beautiful cake, loving the first pic :) and congrats! That cheesecake looks so good Nic! What a wonderful birthday pud - looks so elegant too. must start cooking with mascarpone, keep hearing how good it is, but have hardly ever used it. that looks amazing! the recipe looks simple too. Congrats! That's really exciting about the list :). Just found your blog and am loving it so far! 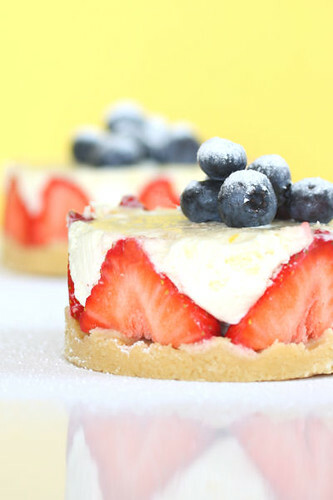 These look amazing, my favourite tastes at the moment are berries and mascarpone so I willl definately be making this very soon. Yum! Gorgeous! I made something so similar once and it was out of this world! Yours has some different flavors and that perfect crust and it really is so birthday party perfect! They look amazing and sound delicious! Congrats on making it onto the list! mouth-watering is a good way to describe your blog and this amazing dessert--well done on both counts! Congrats on being listed. I'm sure this is one of those mouth-watering recipes they were talking about. Thank you for all your wonderful comments - very much appreciated!